Grab your flute and get ready for some fun! This collaborative offering with the Rochester Flute Association offers students the opportunities to focus on making music with fellow flutists through group lessons, workshops, master classes, and flute ensembles. While making new friends in a lively group setting, students will increase their knowledge of tone production, rhythm, technique, and ensemble playing. Students will be placed in choirs based on level. Applicants must have performed a NYSSMA solo at Level 3 or higher. Flute Camp concludes with a performance on Friday, July 19. Participants must provide their own bag lunches. Applications received after June 15 will be assessed on a space-available basis. SPECIAL OPPORTUNITY! One full-tuition scholarship, the Alleen Fraser Scholarship, is available to flutists attending the RFA/Hochstein Flute Camp As this scholarship is provided through the Rochester Flute Association, interested students may apply online at rfaonline.org or contact RFA Education Director Kaitlin Schneider with questions at kateschneider2215@gmail.com. Scholarship application deadline is June 1, 2019. This collaborative offering with the Rochester Flute Association provides an opportunity for younger flute students to develop their skills while making new friends in a lively, supportive setting. 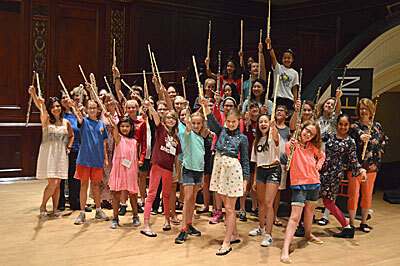 Daily activities will include group lessons, ensemble playing, games, and an opportunity to interact with the older students in the RFA/Hochstein Flute Camp. Junior Flute Camp concludes with a brief performance on Friday, July 19. Participants must provide their own bag lunches. Applications received after June 15 will be assessed on a space-available basis.